Zoe Tongue in Music on 7 March, 2016. Architects’ new single ‘A Match Made In Heaven’ premiered on BBC Radio 1’s Rock Show last night, along with the announcement that the band have recorded a new album, All Our Gods Have Abandoned Us, to be released on May 27th. Two years since Lost Forever // Lost Together, it’s about time the Brighton five-piece released new music, and they have not disappointed. ‘A Match Made In Heaven’ is incredibly heavy, with intense guitar riffs and Sam Carter’s powerful screaming vocals and recurring “bleugh”’s. There’s a political theme to the single, focusing on the destruction cause by war, and the lines “sorry son, but we destroyed your home, we murdered your family, now you’re on your own / collateral damage, face down in the sand” really hit home. The Iraq War is clearly the focus of the single, with the music video showing images of Tony Blair, George Bush, young children, and explosions, but even now the lyrics are relevant to the Syria bombings. Architects offer a critical outlook on the world, and it’s both clever and extremely important to use their music as an outlet for making angry political statements. Tame Impala are a band that I would generally avoid remixes off, because surely it’s impossible to improve on such masterful and interesting original works? The remix of ‘Let It Happen’ from Belgian dance-rockers Soulwax defies this stereotype, however, somehow making the song bigger than it was originally and bringing out the funky mind-melting bassline in a way I didn’t even think was possible. Effects are added to Kevin Parker’s vocals making them even more ethereal than normal over a heavy groove. Nine minutes flies by and before you know it you’re hitting the restart button over and over again. The thing about being a fan of Deaf Havana is that we know that every single track that the band produces will be incredible. It is unquestionable that each of their albums is a meticulously crafted piece of art, the product of relentless hard work and the very best that they can do. Here is a band that care more about making genuine music above making money. ‘Cassiopeia’ is the start of the next step in their career, and it’s is a resoundingly good single. It sounds like something that could almost belong on Fools and Worthless Liars, but it’s different from that era of their music. It’s stronger and deeper, featuring stunning guitar-riffs and beautifully honest lyrics (“In the early hours of the morning, I can’t help but let you in”) and made even more emotive by James Veck-Gilodi’s unique, grainy voice. James most often writes about his own experiences, and has a habit of producing songs which are entirely relatable in some way. 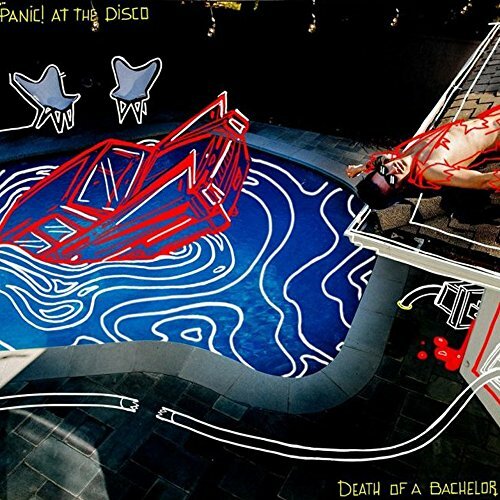 Death of a Bachelor album art.